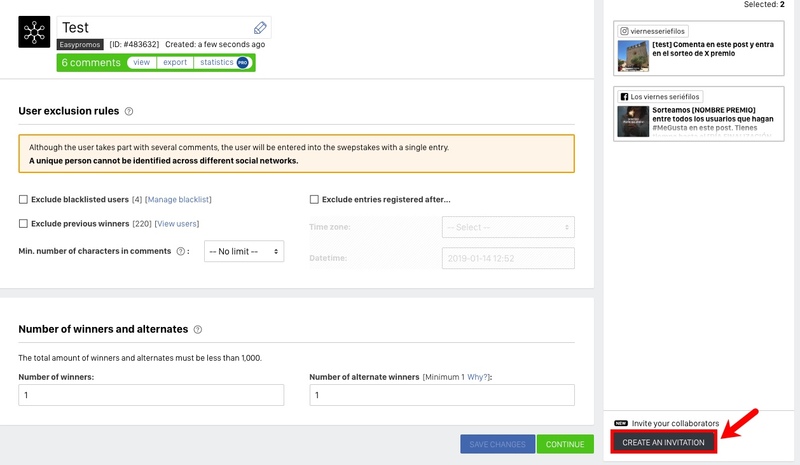 The Multi-Network Giveaway app allows you to add participants from social profiles that you're not an admin of, to a giveaway that you've created. The system will let you send an invitation to the admin of the profile that you want to import participants from so that the admin can select the post and add it to the giveaway. The system to send invitations to external collaborators is only available in the Multi-Network app which is available with the Basic PRO plan ($49/49€) or superior. This tutorial describes the process of inviting an external collaborator in order to import participants from a social media profile that you're not an admin of. Next, enter the organizer and the title of the giveaway and continue to step 3. 1. Select the social network where the post is published. 2. Next, you can select the giveaway post to import the participants. 4. When you click 'Continue' the comments from the selected posts will be imported. 5. When the participants have been imported, we get to the next step where we can send the invitation to the collaborator that we want to add to the giveaway. To be able to add posts from social media profiles that you're not an admin of, you need to send an invitation to the admin of the profile to give him collaborator permission. 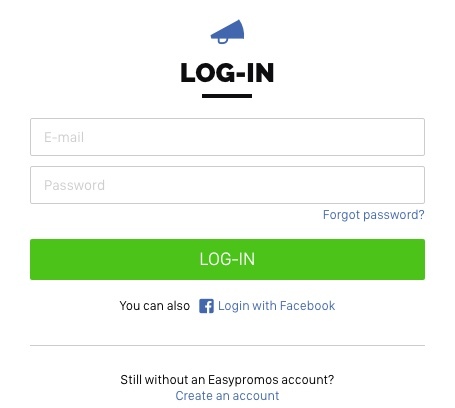 This will allow him to connect to his account and select the giveaway post so that the system can import the participants. Note: It's not necessary for the collaborator to have an Easypromos account. 4. Once the collaborator has given you access and selected the post, the post will appear in the list of posts of the giveaway and its participants will be added to the sweepstakes. When all the participants of the giveaway have been imported, you can continue to select the winners. To do that, you can follow the Multi-Network Giveaway tutorial from step 3. 1. Select a post from a profile you're an admin of. Note: It can be any post but it should have at least one comment. 2. 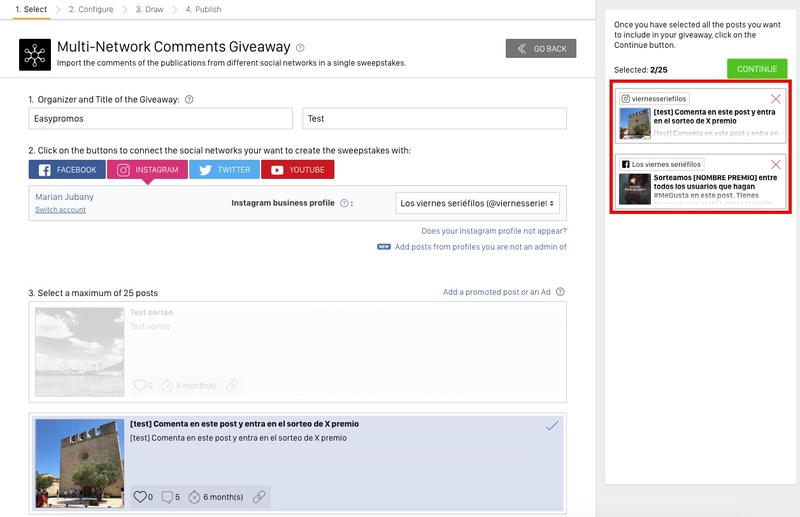 Once selected and you continue, click on "View" to exclude the comments from the post so that they don't enter in the giveaway). 3. Finally, follow step 4 in this tutorial to import the post from the profile you're not an admin of and continue with the configuration of the giveaway. 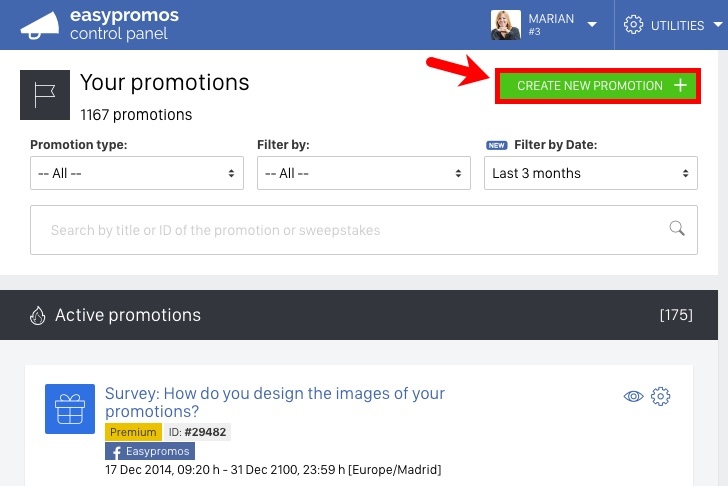 The external collaborators in your giveaway don’t need to have an Easypromos account, they only need to open the invitation link that you will send to them and follow the steps shown on the screen. Even so, it might be a good idea that you help the collaborator so that the process is done correctly. Open the invitation link that you’ll send to them. This link will open in a browser window. 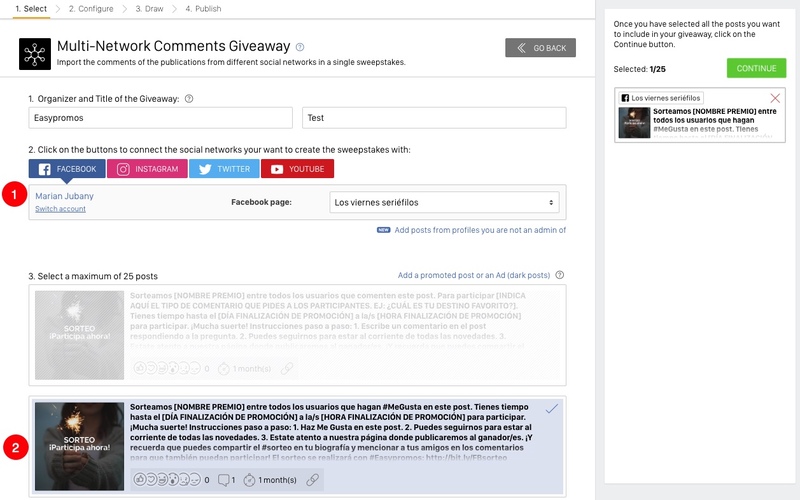 Now, the first thing to do is to connect with the social network profile (Facebook, Instagram, Twitter or YouTube) where the giveaway post that should be added to the giveaway is published. 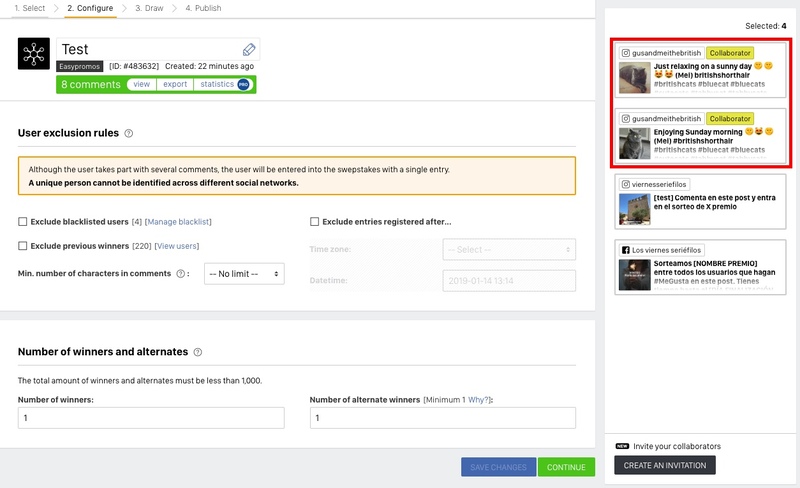 Note: If it’s an Instagram post, the collaborator should connect with a Facebook profile that is an admin of the Facebook page that is linked to the Instagram business profile where the post is published. Once connected to the profile, the system will show a list of the posts on the profile. The collaborators only need to click to select the post they want to add to the giveaway. The post will be marked as selected in the top corner of the screen when it’s been added correctly. If the collaborators need to add a promoted post, they should click on the option “Add a promoted post or an Ad (dark posts)” which will allow them to connect with their ads account to select the post. Finally, when the post has been added to the giveaway, the last thing the collaborator needs to do is to click on the “Continue” button in the top right corner to begin to import the comments. A message will let the collaborator know when the import process has finished, which means that the comments from the post have been added to the giveaway and the administrator will be able to see them.